I LOVE, LOVE, LOVE the window garden in my upstairs bath. 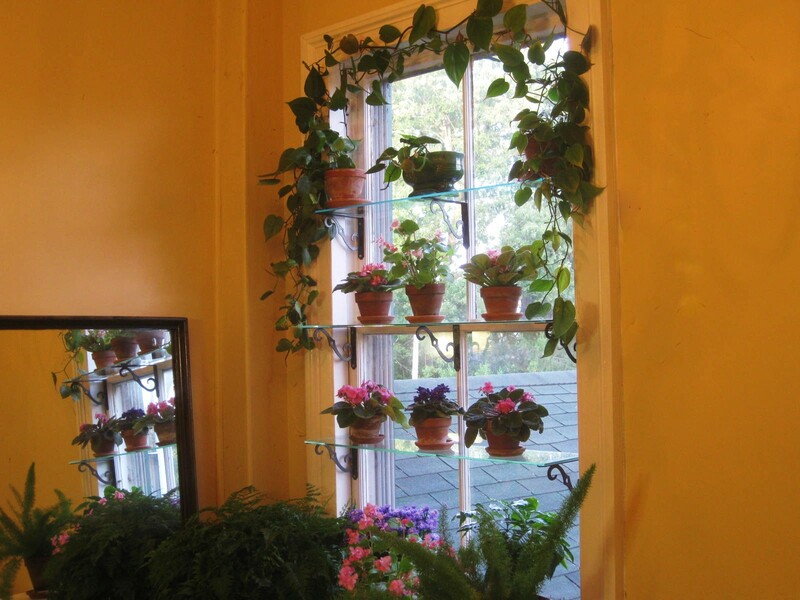 This is an ordinary window that I outfitted for the decorative display and easy maintenance of houseplants. 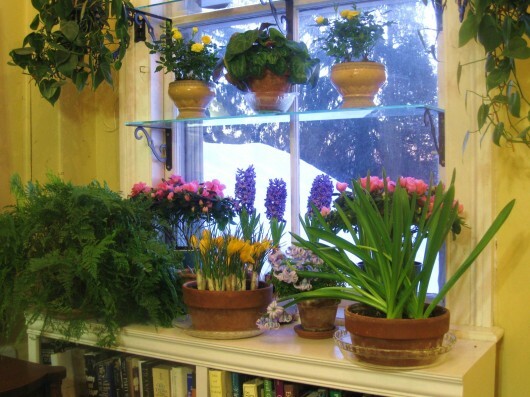 If you’d like to produce a living “wow” effect for your home, I can assure you that a window garden is the way to go. Pictured above is my window before it became a garden. It’s an east-facing exposure which, thanks to an ancient beech tree, receives only dappled light in summer. But when the tree drops its leaves in autumn, the window becomes flooded with morning sun. 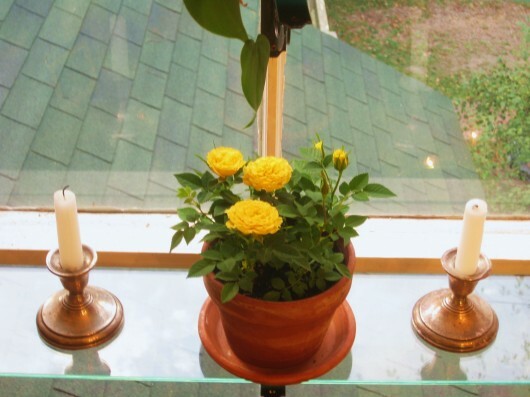 Now, if a plain window is to perform a Cinderella act, it must first be equipped for the happy containment of plants. Let’s start with the sill. 1. Widen the sill. A narrow window sill is useless. 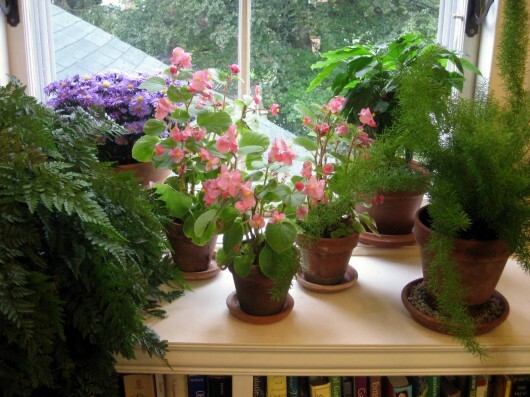 You might be able to place a few pots there, but there’s not enough room for an enticing “plant-scape.” The easiest answer to a narrow sill is a bookcase or a cabinet. I found the bookcase pictured above at a shop that sells unfinished furniture. 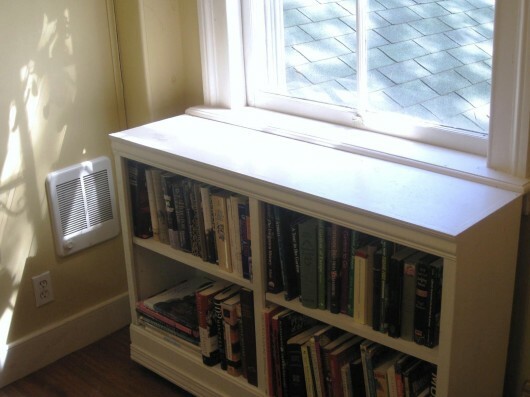 The bookcase reaches the height of the existing sill, and its width is the same as the window frame. I painted the case to match the window trim. A broad windowsill provides healthy, un-cramped quarters for plants, such as the ferns and wax begonias pictured above. But make no mistake — the garden must not stop at the sill, or the plant picture will look inadequate. By “inadequate,” I mean it will look like a one-line drawing. To be a masterful portrait, the entire window must be put into play. And that’s where glass shelves come to the rescue. 2. Install glass shelves. This is an easy job. 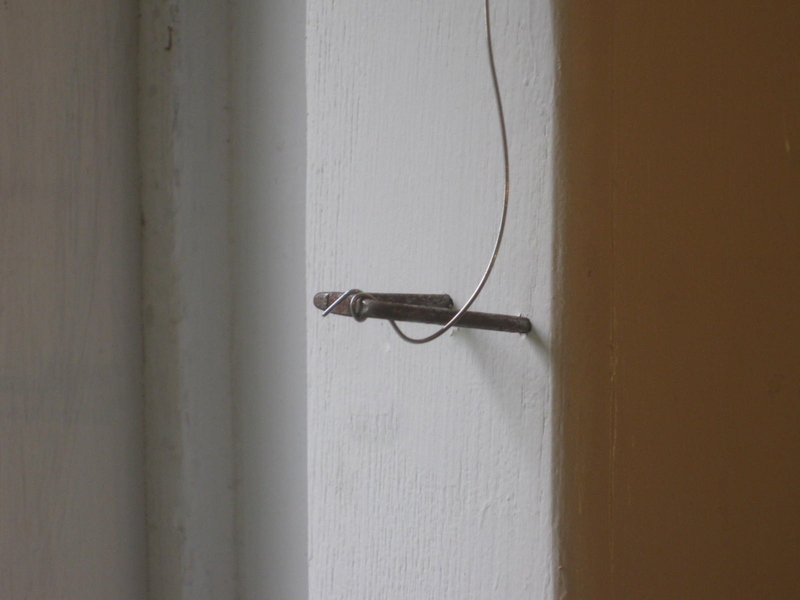 As you can see, I mounted bronze-colored, scrolled shelf-supports to the window frame, using standard wood screws. (Shelf supports are available at any hardware store.) Line the supports up with the latch ledge, and then mount more supports equal distance above and below the ledge. This will take you all of 5 minutes if you have an electric drill. Set the glass shelves on their supports. I used 1/2-inch thick shelves, which were acquired from a glass cutting shop. They were acquired for a song, too, because I asked the shop to use “salvage” glass. The shelves are 8 inches wide, and perfectly suited for plants in 4- or 5-inch pots. These small pots are what African violets and wax begonias usually prefer. 3. Arrange lengths of wire. With the broad sill and shelves in place, the final step is to string wire along the window frame. I’ll explain why in a moment. To secure the wire, hammer 2-inch staples (available at any hardware store) along the top and half-way up the sides of the frame. Now set two pots of vines on each end of the top shelf. I used philodendron for the window above, and grape ivy in another, similar garden. As the vines grow, they will climb (with a little assistance from you) up the sides of the window, and join together at the top. This will produce a leafy-green frame for the living portrait within. 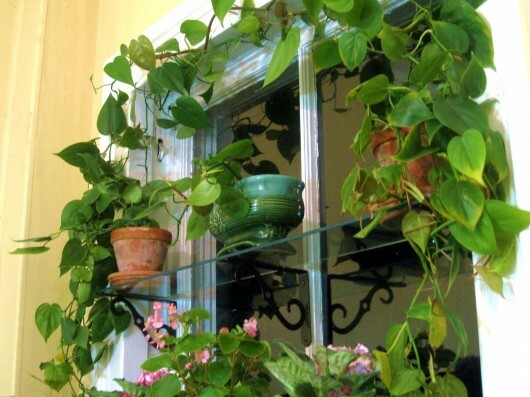 And by the way, the only permanent features of a window garden are the vines, the glass shelves, and the broad sill. The plants themselves can be moved from shelf to shelf until you find an arrangement that floats your boat. Plants can be changed to suit the season. For instance, in autumn I like to feature chrysanthemums, miniature roses, and African violets. All these flourish in the bright light an east or west window affords. 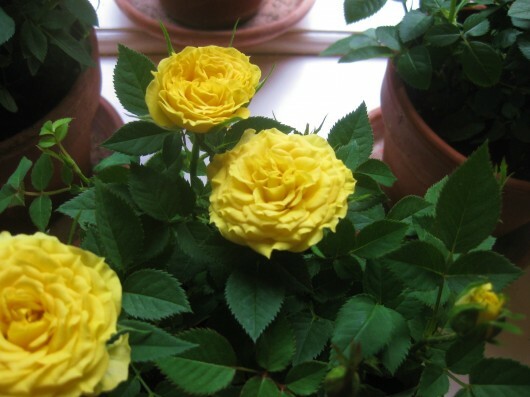 I should probably mention that miniature roses (in 5-inch pots) always look sweet on a broad window sill, in association with ferns. Just one miniature rose, if placed between a pair of silver candlesticks, can look beautiful on a glass shelf. 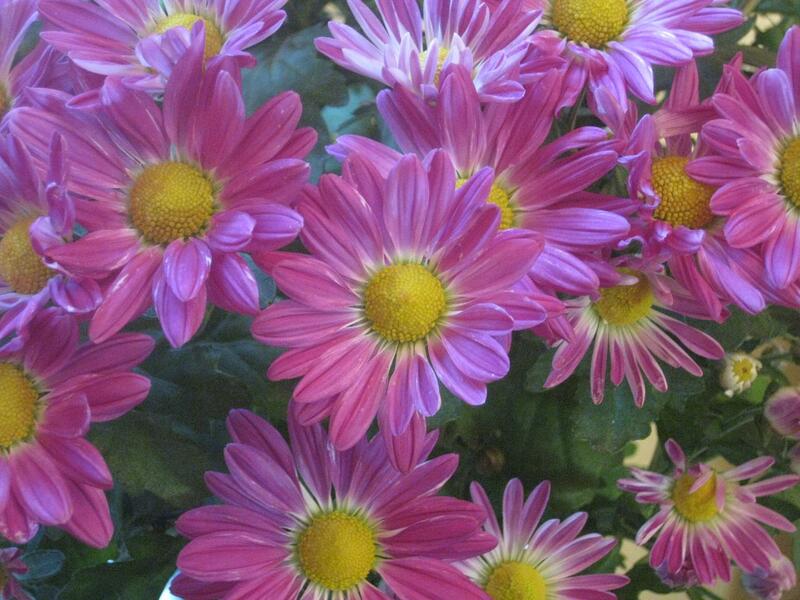 Chrysanthemums, of course, are an absolute must in autumn. Indoors, they bloom and bloom from September all the way through November. African violets, if you collect them, are practically made for the glass shelves. Ditto for wax begonias. A Christmas show is fun to design. Just replace the African violets with poinsettias. 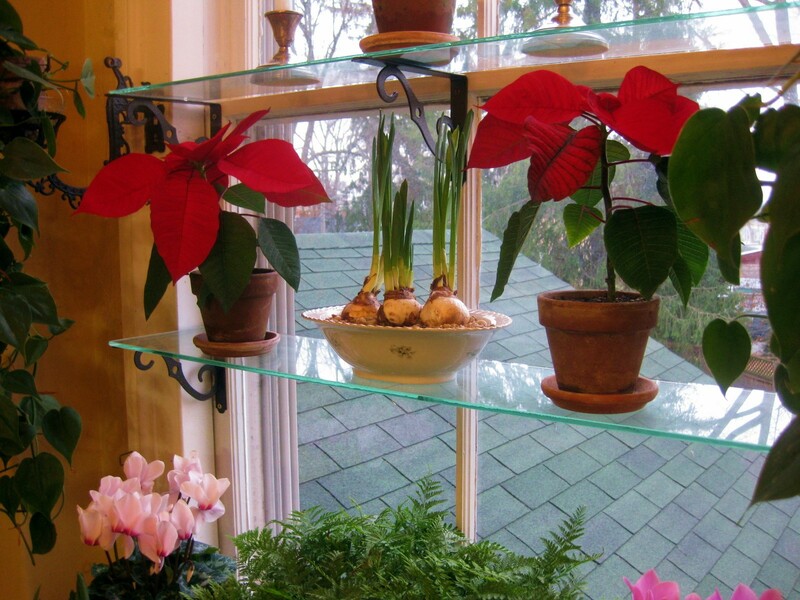 In the picture above, red poinsettias flank a bowl of narcissus on the first shelf, while pink and rose cyclamens flank a rabbit’s foot fern on the broad sill. To arrange an awesome mid-winter picture, I like to place home-forced bulbs — like ‘Blue Jacket’ hyacinths and ‘Golden Yellow’ crocuses — between a pair of pink azaleas on the broad sill. And on the first shelf, I enjoy the sight of yellow roses flanking my home-grown cyclamen. Meanwhile, on the third shelf, I find that fragrant muscari (grape hyacinths), forced in a blue and white china bowl, and set between red-toned African violets, creates an authentic preview of spring. Well, I hope I’ve inspired some of you to design such a garden for your own home. When you outfit a window for the contentment and containment of plants, the decorative possibilities are unlimited. Questions or comments? Leave me a note in the comments field below. Just Beautiful.. You are so talented.. I adore this website. If only so I can dream that perhaps a small corner of my house could ever look so lovely. Hey, Kevin! Love the step by step you gave. Love the way you use a large mirror to bounce around the light and color even more! Sadly, we have side to side slider type windows made out of vinyl and very few of them at that. I’m trying to think of a way we can adapt your process to work in our home and still be able to open the window in the summer. Currently, there is a large baker’s rack in front of one window that houses all of my “babies” and it looks a bit clunky/chunky. Any creative ideas or thoughts from you? Thanks again for the gorgeous pics and tutorial! T – If you mount the shelf-supports to the frame of your sliding windows, you will be able to enjoy the look of gleaming glass shelves. Space the shelves far enough apart to permit the opening and closing of your window. And in summer, move your plants outdoors, just as I do. They need a little holiday! 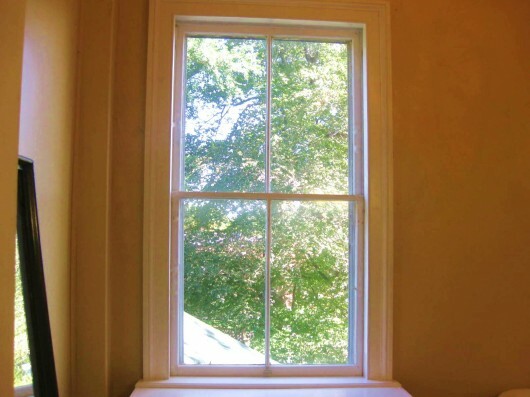 I have plans to do this to my bathroom window since it’s east facing, and the same like yours, has great sunlight when the maple tree is leafless! I love those mini roses! I bet they smell so sweet. houses without plants are so empty. Donna B. – So glad you feel inspired to design a window garden. Bi-fold door sounds like a good solution to ensure the window is on view. Elaine – I couldn’t agree with you more. Well cared for and displayed in some imaginative way, houseplants practically exude good energy. I can’t imagine spending a winter without them. I love this!!! I’ve been looking for something for our living room windows and this is it! I notice that you have three supports on the top shelves, but only two supports on the bottom. Are three supports always necessary? relocated violets are sensitive to the change? Thank you always for your fabulous ideas. Hi Judy R – For years I used only 2 supports per shelf in my 36-inch-wide window. This worked very well when I limited plants to the 3- or 4-inch pot size. But when I added larger pots to the upper shelves I find the shelves sagged slightly. Hence I added a third support for the sake of appearance. I can tell you that glass shelves — when they are of 1/2-inch thickness — can handle quite a bit of weight. Awesome, inspiring and absolutely wonderful! Thank you, Kevin!! It’s on my someday list!! I replaced 100 old window frames with metal/glass. Supposed to be warmer in house, NOT. I do have wood on frames. How would I go about placing glass shelves there? Love your windows, sooooo beautiful!!! Thanks for sharing your windows with all of us! Hi Janice – Since your frames are wood, you can mount the shelf-supports to them. Then set the glass shelves in place, and you’re good to go. Have fun designing your “horticultural portrait”! Can this be done on a south facing window? Will it be to sunn? My East facing window is shaded by many things (mainly garage). I love the idea, but i don’t want to kill anything with direct light. Hi Robin – There are houseplants for every window. The garden I created for my Music Room window faces south — have a look! I have a problem with the saucers under indoor plants absorbing water and circling wood or painted surfaces. Do you seal the terracotta saucers used under your pots in your indoor gardens? If so what do you use to seal the saucers? Hi Sylvia – Some of my clay saucers are glazed on one side. The glaze keeps moisture from seeping through and potentially leaving a mark on woodwork. If you’d like to seal your saucers, just sand them lightly, and then coat them with polyurethane. You need only to coat the top of the saucer. Can I place a bag Tulips or Hyacinths in the refrigerator, before forcing in a glass bulb or bowl containers for 10 weeks, to get the same effect , before actually planting them in potting soil? I understand its best to keep bulbs away from fruit during forcing stage to prevent the bulbs from becoming sterile from the gases the fruit give off during ripening. I also have heard of placing the bulbs in a plastic bag, tied shut, or bulbs potted in a clay pot placed in a clear plastic bag to retain moisture and keep the gases @ bay, from other vegetables or fruits. What’s your thoughts. Anita – I’ve tried refrigerating un-planted bulbs. They never bloom as well as those which are first potted (or vased) and then refrigerated. This, I think, is because bulbs in nature always make their roots during the cold months of winter. Martha – I’ll try to find a glass-cutting shop for you. In which town do you live? Kevin, I have no options for a third support, and the space my shelf would have to span would be about 38″ or so. Do you think the1/2″ glass would support that width? I wish you sold Christmas cards with photos of your window gardens. They are works of art! Susi – My shelves are 36 inches long and 8 inches wide. If you can’t have a third support, you can make up the difference by increasing the width of the shelves. Shelves which are 10-12 inches wide (and 1/2-inch thick) provide more surface room to balance out the weight. My friend Anne has only 2 supports for each of her 12-inch-wide window shelves. The shelves do not sag at all. Alice – Well, now you’ve given me an idea. Thank you. 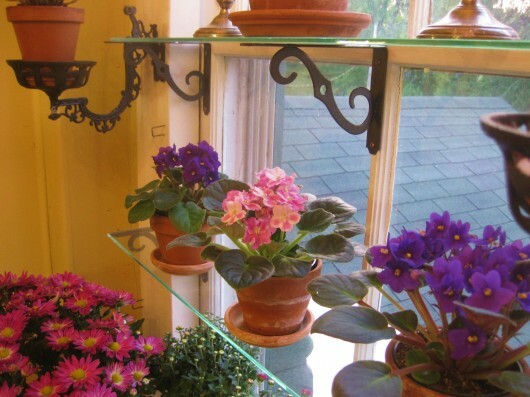 Hi Kevin, on the picture of the African Violets, I see next to the brace for the glass shelf, you have a plant holder added to each side. These are beautiful! Where would one find something like this, was it a candle holder?? Hi Jennifer – The pot holders are, in fact, old kerosene lamp brackets. You can find them for auction at Ebay.com. I’ve purchased several over the years — they are made of cast iron, and very ornate. Perfect for a window garden! I have a whole expanse of sliding windows each of which is about 46×50 on the north side of my house. I have several incandescent bulbs in this narrow room and I plan on installing some florescent bulbs too in the near future. I’ve always wanted to grow some plants in this room, but its location on the north side has always put me off. Your plants look so beautiful. Could I grow any of those with the extra light I’m adding? Could you suggest any others that might be more suitable? Are you able to open the windows? All of the windows open so there’s good ventilation. I just LOVE this! it reminds me so much of England. Thank you for sharing. Using this configuration of shelves, can you still open the window? 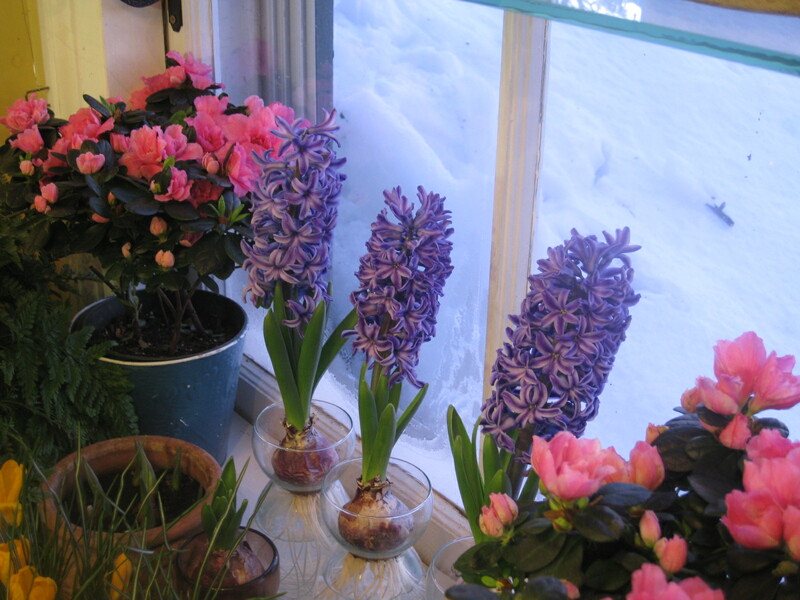 Hi Laura – In winter, when the garden is in place, I can still open the window — just not all the way (I rarely open my windows during the cold season). If you have a double-hung window like mine, you can always remove the top two shelf-supports during summer. Then the window will open as usual. Keep in mind that the glass shelves are not bolted to anything. They are easy to remove. This is fabulously inspiring! Thank you for this idea. I can do this! Thanks for sharing this. It is something I can and will do, if I can find the shelves. My landlord recently put in some new windows in this old house I rent. He let me keep some of the old windows and I have a few ideas for them. The front porch is as long as the house and about 8 ft. wide. It’s on a hill and the wind is rough at times. I thought of hanging two windows, with chains, on each end to kinda use as a windbreak. As an artist wannabe, I was going to try to paint flowers on the glass or even glue some glitzy colors on for a stained glass effect. I now can use your idea. I can add shelves to the hanging windows and display plants in summer. Oh, what to do! 🙂 I am not sure as how to prepare the windows for outside. I guess I should paint them and seal around the glass. Helpful ideas appreciated. Kevin, beautiful, like everything you touch! You are an inspiration to me. use plants outside that are for zone 5.
in dried up Boise, I have not even been able to keep a African Violet..so dry. would do that in Boise in the winter. good distance back from the windows? We do have some cold temperatures. I have lost all but one CA houseplant, so I am kinda’ leary. Any suggestions? Looking for acrylic hanging window shelves, I ran across this item. It makes setting up what I dreamed of seem so simple. Thank you for your time in explaining the steps and providing beautiful picture examples. It’s perfect for what I am planning to do. Thanks again….. so much!!!! Getting my plants indoors for another COLD and LONG winter here in the east coast …. BEAT those WINTER BLUES !!!!! ……….GREAT JOB !!!!!! ……… THANKS FOR SHARING !!!! Hi Kevin, What a great idea. 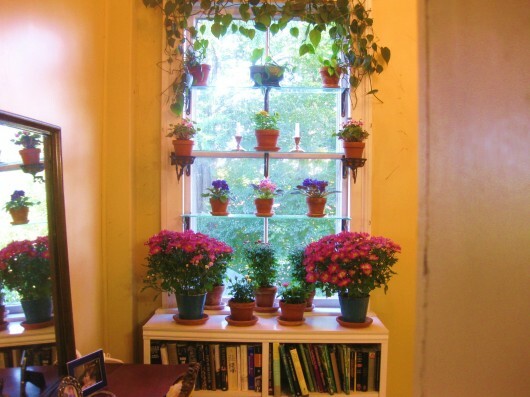 I want to do this for my south-facing green house kitchen window, and put my herbs there. However, there is one problem. The vertical wood surfaces in the corners of the window, which is where I should mount the support brackets, are not parallel with the window. They are on a forty five degree angle. Do you think I could still use your designs except that my brackets would not stick out straight from the window, they would be on a forty five degree angle as they support the glass shelves in each corner? Thanks again for the inspiration and clear step by step instructions! I have old windows and I get a board that is wider and cut it the size of the window sill and sit the plants on top of that to extent it out as that is a cheap way for me to do it. Just paint it white and you can’t tell it is there. Great job Kevin. Love your letters and site. Kevin – I have been wracking my brains on how to bring my herbs indoors for winter -without filling all my window sills-my dog would only end up knocking them over anyway – can’t believe that I forgot about this – I am from England – This is a normal sight amongst avid gardeners – Thank you so much for the reminder! I’ll be using a deck style long planter on the sill itself -I’m trying for an indoor salad garden – In order to protect wooden sills, I often saw shallow troughs made of copper – quite malleable and easy to seal the edges at home – then filled with marble chips – I have no idea if they had a felt bottom – but they certainly trapped any excess water. DIY stores also sell marble thresholds for around $10 – $20 that can sit on top of the sill. I hope that is helpful. Hi Kevin – what an inspiration you are! 2 questions: how much room do you allow between shelves? Annnnnnd – what plants do you suggest in a room with a wood stove – winter temps can be in the 70’s and dry heat. That room has north and west exposures. Hi Kevin! I just Love this window garden and will ponder this idea for above my kitchen sink. If it works it will be so much less expensive than an all out new installed Garden Window. One of my concerns is the vinyl window frame and my worry if it will be enough to hold the shelf. I will only be able to use 2 brackets per shelf. Hi Laura Smith – Because my window frames and trim are made of wood, I used ordinary wood screws to attach the shelf-supports (brackets). Not sure what kind of screws would be needed for vinyl. I suspect a contractor — or even a hardware store — can advise you on the matter. Good luck with your project! I love this it’s beautiful, I am doing this to grow herbs in my kitchen. I will need to use 36in I found 1/4 inch will it sag if I only use 2 brackets? Hi Delena – I think my shelves are the same as yours — 36-inches long. Two brackets will suffice for a shelf that is at least 8 inches wide. Have fun with your herb-growing project! I absolutely adore this window! 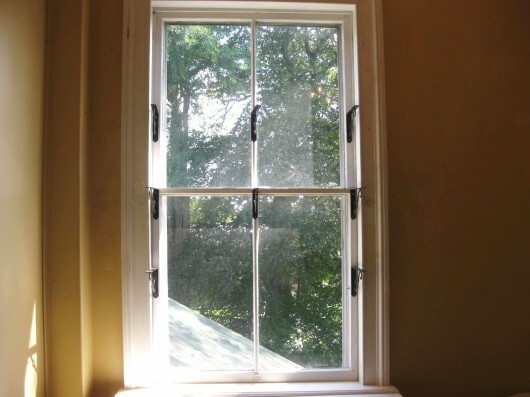 We recently bought a 105yr old house and we have the same windows so I am wanting to do this immediately! I was wondering if you could tell me where you got your shelving brackets/supports? I am having a hard time finding some that will fit an 8inch shelf. It could be that I’m not good at technology… lol Any help would be greatly appreciated! Hi Beth – My shelf supports were obtained from a local Tru Value hardware store, but I’ve seen similar supports at Lowes and Home Depot. Have fun making a “real” window garden! Hi Kevin. I did the same thing with glass shelves but I have no post in the middle for support. And my shelves are,I think 40″ long I put the metal bracket holders on my wall right next to the window then I put the brackets on it to hold the glass shelves. But I didn’t know I should get 1/2″ glass I got 1/4″ glass shelves so I am afraid of putting too many African violets on them I put up 3 shelves be for but only have 2 up now and only 3 small African violets on them. Do you think i should get 3 more shelves to add to these making them 1/2″ thick for the support? I almost knew when I got them they might not be strong enough to hold the plants. Especial with no middle support? I didn’t think to ask for salvaged glass at the glass place I got mine. I love the garden window mine is in my South window the only one that is small enough to do it. But I keep my litt k curtains closed so the hot sun doesnt burn them. Oh I got my shelving at Home Depot. Love your brackets better than mine they are very beautiful mine are just plain white to match the brackets . Thank you Kevin love ya! Inspiration flows with every newsletter! It’s a happy morning when your blog appears. I have seen this published before and it has always fascinated me. I’ve collected some of the plants and the brackets. But my problem is that all 3 of my bathrooms have the window so close to the toilet that it would be impossible to get the book case in let alone glass shelves. There are two windows in stairwells. What do you think? They are way over my head and would involve getting the folding ladder out to stand on the stairs to water and care for the plants. Then the house is 112 years old and the new windows I put in are tip in to clean. I can imagine with some help, getting up there and taking the plants down and the glass shelves down…..is this worth it? Glad that you showed this again. I have round tables with table cloths and set a few plants and favorite seasonal nick knacks on to create a little whimsy. Would love some ideas on table tops you can suggest. Putting away summer soon and need some ideas for fall and winter. I enjoy your plant and cooking advice. Have a nice week! thank you for answering and replying to questions and comments. An interactive blog is much more fun. Now if only I’d have won the purple mixer…. Kevin, I LOVE your window garden. You give us such great step by step details on how to create our own window garden. I also like your tip about putting African Violets and Wax Begonias in 4 to 5 inch pots. I never knew they prefer that size. That just happens to be the size pot that I have my African Violet in right now. After I first got it , it lost all of it’s flowers and several leaves. So then I put it in a different pot and moved it to a brighter location. I also started moving it to a east facing windowsill in the morning and a west facing windowsill in the late afternoon. That seems to being doing the trick because since I started doing this, it has stopped dropping leaves, and I’m happy to say that it has 3 new leaves growing on it. I hope it will have flowers again some day. Oh my! My mother used to do that with her violets! Brought back memories of my childhood. not sure where to ask this question as is unrelated to this topic.. what is your experience with terrariums? and any ideas for same? I live in Minneapolis the window I have that would work faces south can that work or is it too hot? 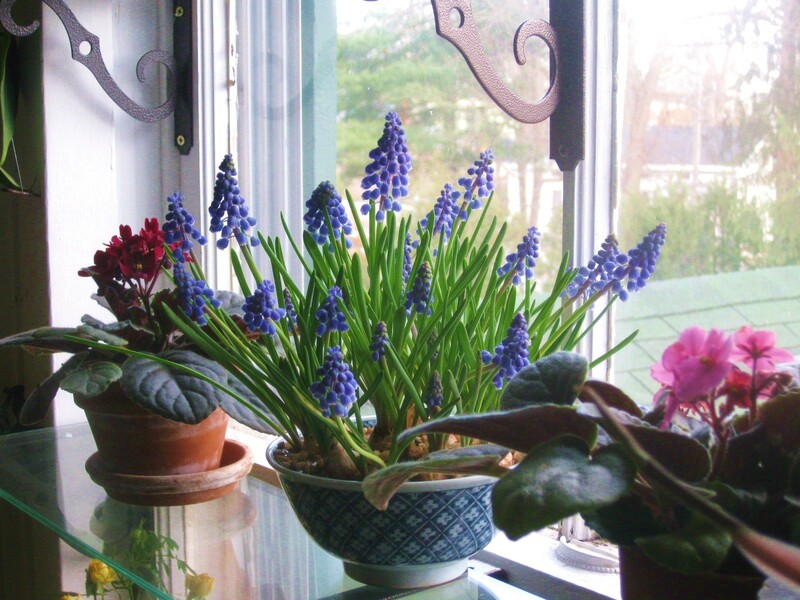 Your garden window looks wonderful – plants really make a house a home in my opinion. My efficient little bathroom isn’t giving up any space for flowers unfortunately. 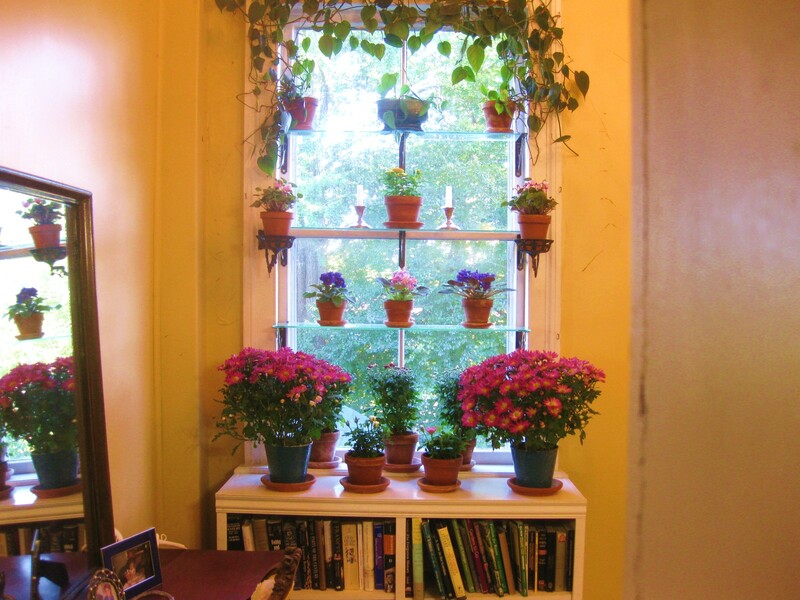 A few (many) years ago I would trim back potted impatiens plants that had been on the porch through the summer and hang them in my dinning room windows. They were knockouts after just a month – blooming profusely – oh yes, and dropping spent blossoms unfortunately. They really brightened my winters way out in the country with snowstorms that rivaled anything upper NY gets today. Today I have amaryllis blooming in my dining room – I really love them but they are short-lived of course. My spider plants have many babies that I often use in creating pots for on the porch and deck, they grow fast and add wonderful texture to pots along with German ivy. These are my standbys as they are easy to grow and thrive just about anywhere. Thanks for your weekly ideas – and I love all the comments from your followers. Love your window garden! Could you suggest plants for my kitchen window which has a northern exposure? I would REALLY love to do something like this in my picture window. Any advice on how to secure shelving to the middle, which has no wood to attach it? Kevin, in your opinion, which gives the best sun exposure without frying my plants, east or west? I live in central California and it is nothing for it to get to 100-degrees in July and August. I thought of putting a window garden in the window off my kitchen which faces east and would get morning sun, but I have another option of placing it in a window off my office, which faces west and is also shaded by a large tree thankfully. If not for that tree, any plant in that window would fry. Thanks! Kevin, I’ve been wanting to do this for ever. But I see that my window is not made for the brackets to come the way you’ve got them. And I need smaller, llighter weight brackets. Not the clunky ones I have now. It’s a garden window with a door that cranks out. The edge is very narrow. I’ll go back to the drawing board. I love your window display. I am very interested in how you have gotten your African Violets looking so lovely. They are one of my favorites but never have much luck growing them. I have a southern window exposure in the front of the house. Right now there are some herbs that I have brought in for the winter, a couple of sweet potato plants that I use for cuttings and a Red Banana Tree plant in this area. Can you give me some tips for growing the violets in a southern window, other than using grow lights. Thanks for any tips you can provide. I love your website and all your information. This is a lovely display. I have one display in a wide window and two small shelves with plants on them. My major problem is that I have five indoor cats who would absolutely LOVE to get into the middle of these plants!! All of my plants have to be up and out of their reaches — sometimes that is quite the challenge. love your shelves. how would I mount shelving in bay window. one shelf across or three small ones to go with shape of bay window. I plan to have just one layer of shelving about 10 inches down in window. Hi Kevin I’ve got little bugs on my plants. What do you recommend? Thanks. I love this! I want to have it over my kitchen sink. Thank you for this post. I’ve been describing to my husband what I want, and now I can show him. Beautiful and healthy to grow plants inside all year around. Happy Thanksgiving to you and yours. Here in Canada we celebrated already because we are such “eager beavers”. Your chats as you call them are full of great ideas and your lovely sense of humour. I welcome your weekly visits to my house. I love the glass shelves. I am in the process of figuring out how to make some of my own. You say your glass is 1/2 inch thick. In the pictures they do not look 1/2 inch thick. Are they a measured 1/2 inch? You post that the glass is 1/2 inch thick. It does not look 1/2 inch thick. It is a measured 1/2 inch? Or, is it like buying a 2×4, that is really not 2 inches by 4 inches??? Just lovely. I wish I could figure out a way to adapt it to my modern polyvinyl framed window with a radiator in the wall beneath. Still…inspiring! Boo hoo. I have no window in my bathroom of this 225 year old house. 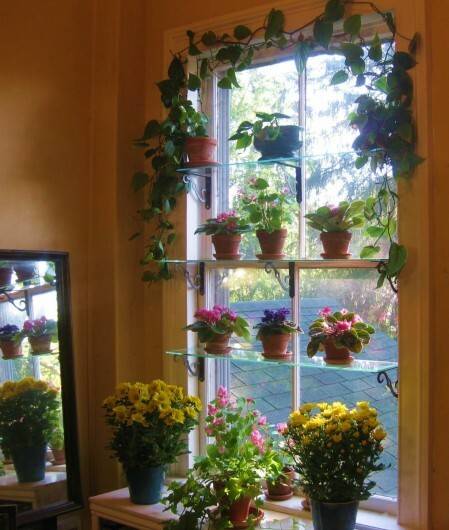 Kevin-loved this window garden idea. I live in Oklahoma and my bathroom window is on the south. We have 3’ raves but it gets abundant sun. I need ideas for plants please. Beautiful ideas. Thanks, Kevin. Can’t wait to try your spoon bread and broccoli casserole -sounds delicious. I love using your wonderful cookbook, too! I have a’Garden Window’ in my kitchen. It’s an Eastern exposure. I grew 2 pots of geraniums this winter and they’re are thriving! In the beginning, I watered with Miracke grow every 2 weeks, then I watered with a weak mixture after that. For the last several months, I use water only when dry. My question: are there annuals that will do well in this environment during the summer months? Perhaps, I should leave my Beautiful, healthy geraniums where they are for the summer. What would you recommend? Hi Mary Jane – Geraniums, like children, need a summer vacation out of doors. There, in the fresh, humid air, they quickly recover from their indoor sojourn, and build the strength they need for another productive winter in the window garden!